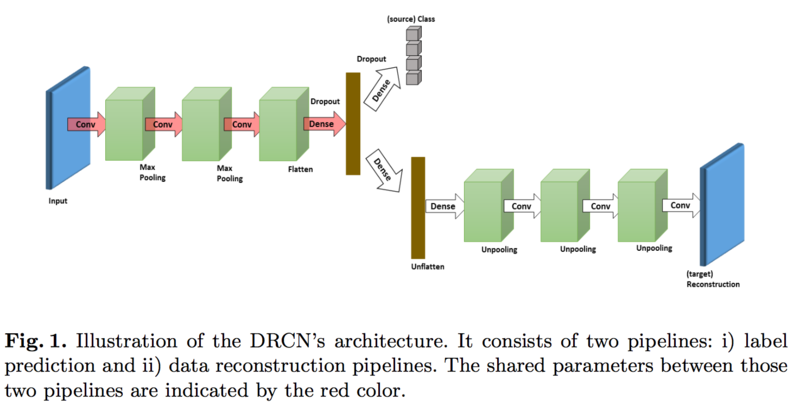 Paper summary leopaillier _Objective:_ Build a network easily trainable by back-propagation to perform unsupervised domain adaptation while at the same time learning a good embedding for both source and target domains. _Dataset:_ [SVHN](ufldl.stanford.edu/housenumbers/), [MNIST](yann.lecun.com/exdb/mnist/), [USPS](https://www.otexts.org/1577), [CIFAR](https://www.cs.toronto.edu/%7Ekriz/cifar.html) and [STL](https://cs.stanford.edu/%7Eacoates/stl10/). ## Architecture: Very similar to RevGrad but with some differences. Basically a shared encoder and then a classifier and a reconstructor. [! [screen shot 2017-05-22 at 6 11 22 pm](https://cloud.githubusercontent.com/assets/17261080/26318076/21361592-3f1a-11e7-9213-9cc07cfe2f2a.png)](https://cloud.githubusercontent.com/assets/17261080/26318076/21361592-3f1a-11e7-9213-9cc07cfe2f2a.png) The two losses are: * the usual cross-entropy with softmax for the classifier * the pixel-wise squared loss for reconstruction Which are then combined using a trade-off hyper-parameter between classification and reconstruction. They also use data augmentation to generate additional training data during the supervised training using only geometrical deformation: translation, rotation, skewing, and scaling Plus denoising to reconstruct clean inputs given their noisy counterparts (zero-masked noise and Gaussian noise). ## Results: Outperforms state of the art on most tasks at the time, now outperformed itself by Generate To Adapt on most tasks. _Objective:_ Build a network easily trainable by back-propagation to perform unsupervised domain adaptation while at the same time learning a good embedding for both source and target domains. _Dataset:_ [SVHN](ufldl.stanford.edu/housenumbers/), [MNIST](yann.lecun.com/exdb/mnist/), [USPS](https://www.otexts.org/1577), [CIFAR](https://www.cs.toronto.edu/%7Ekriz/cifar.html) and [STL](https://cs.stanford.edu/%7Eacoates/stl10/). Very similar to RevGrad but with some differences. Basically a shared encoder and then a classifier and a reconstructor. Which are then combined using a trade-off hyper-parameter between classification and reconstruction. Plus denoising to reconstruct clean inputs given their noisy counterparts (zero-masked noise and Gaussian noise). Outperforms state of the art on most tasks at the time, now outperformed itself by Generate To Adapt on most tasks.